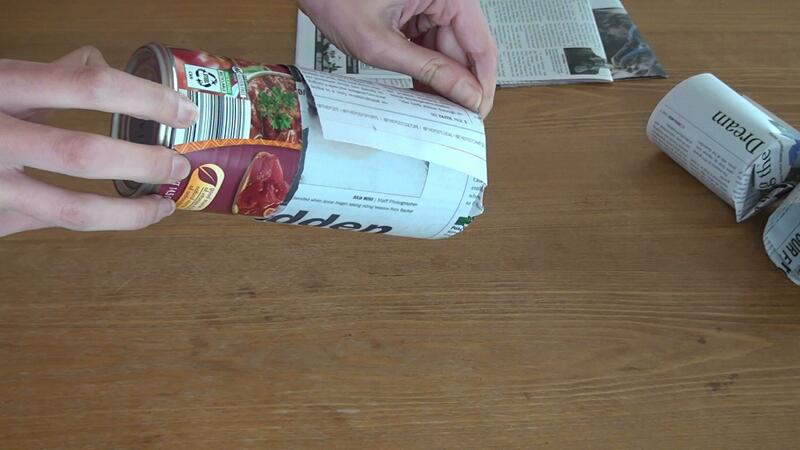 Cut the newspaper into strips about as tall as the can, with a couple of extra inches at one end for the bottom. 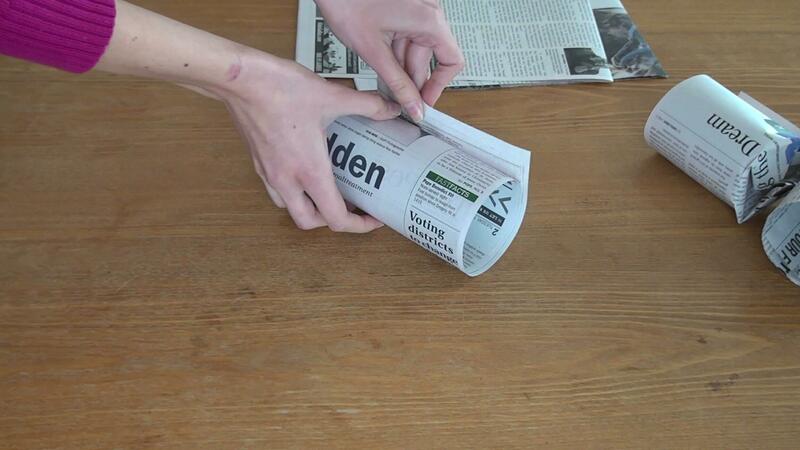 Start rolling one page of the newspaper. 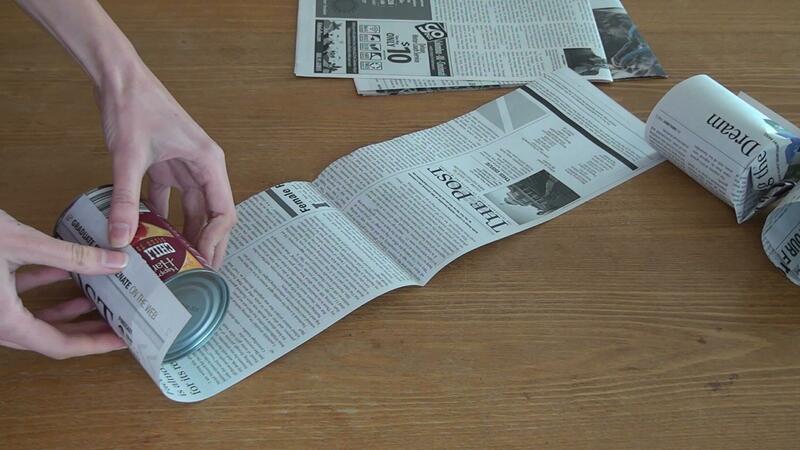 Roll the newspaper around the can a couple of times, do not do it too tight, because you will have to remove the can and it would be difficult if you rolled it too tight. 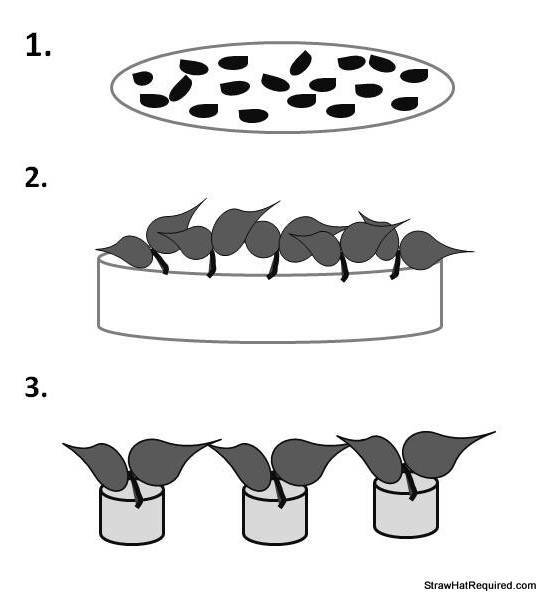 Fold in the overhanging ends, creating four folds as shown below. 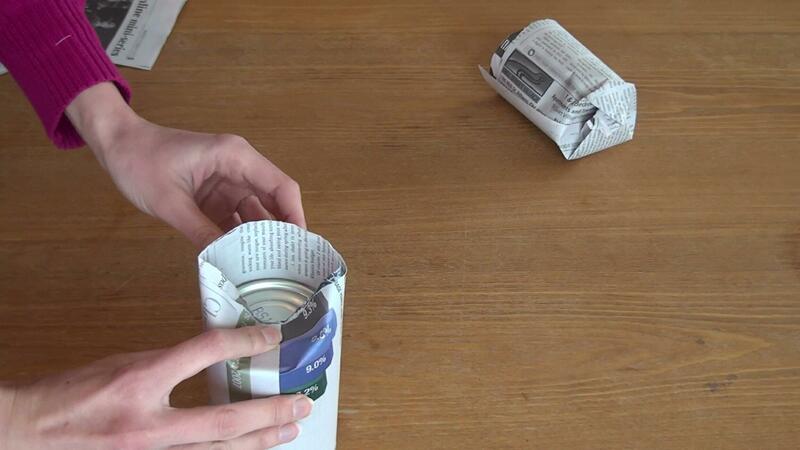 Your pot is basically ready, invert the can and press hard to secure the bottom. 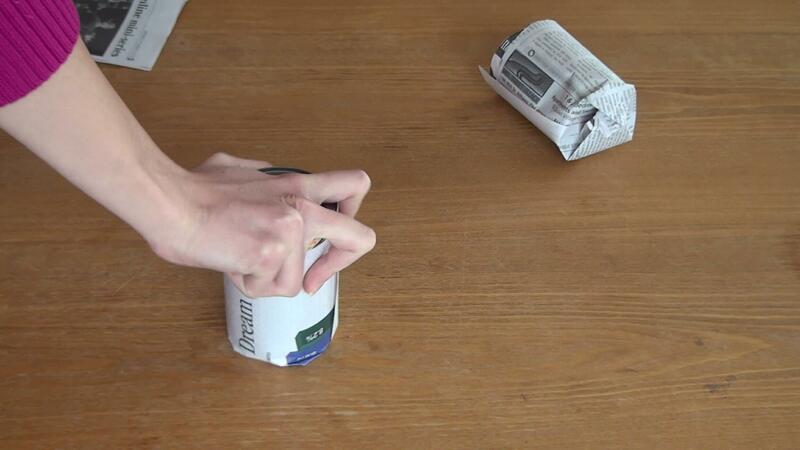 Gently remove the can by holding the bottom of the pot and pulling the can from the top. 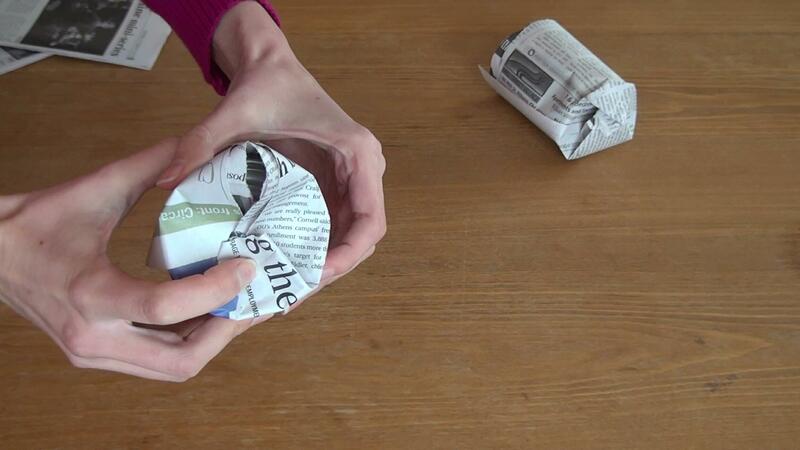 Here you have a biodegradable, free and fun to make pot for your plants! Just do not forget to place a plastic shallow container underneath your pot to catch the excess liquid when you water your plants. Here are my pepper plants happily enjoying their environmentally friendly temporary houses (you can learn how to start your peppers from seeds here). In the left lower corner of the picture, you can see smaller pots housing collards. Aren’t they cute little plants? Try this fun way of making pots and let me know what plants found homes in them. Starting eggplants, tomatoes and peppers from seeds. The method below describes a very good way to start tomatoes, peppers and eggplant. This is a tried and true method; been doing this for years and it gives the best results. 1. Sow seeds close to each other in a shallow container (about 2 inches deep). Add soil to just cover the seeds. Keep moist and warm. 2. 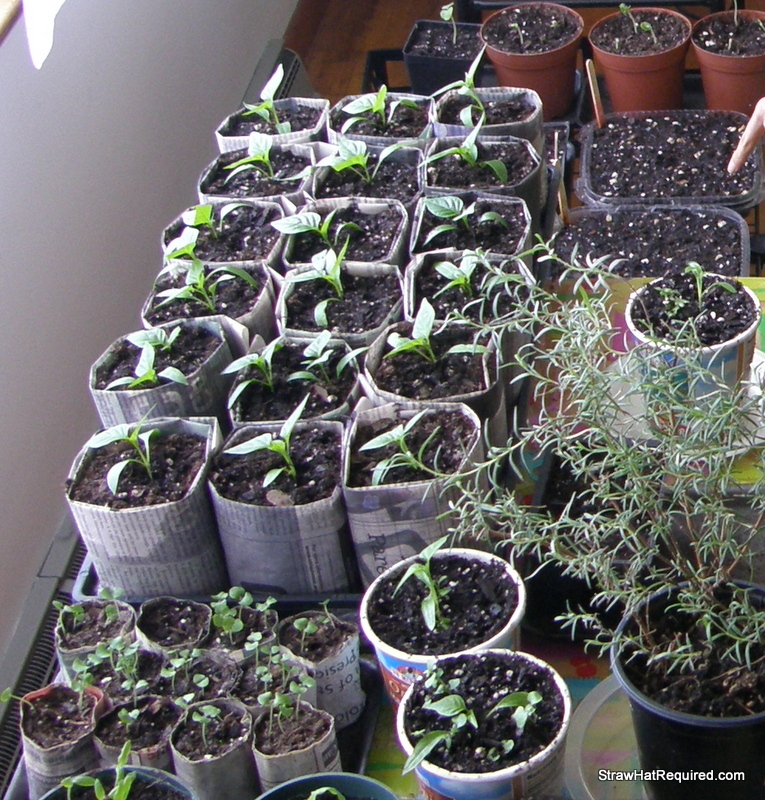 When seeds germinate, place in a warm sunny location, keep moist but do not over water. 3. After the first true leaves appear, choose the best plants and gently transplant into individual containers (learn how to make biodegradable newspaper pots). 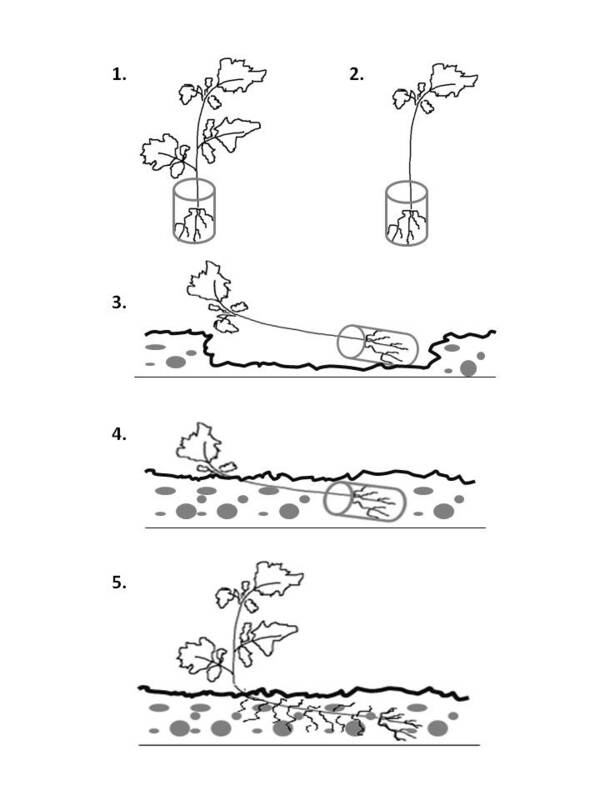 Place the plants as deep into the soil as the first leaves – the stem will grow roots. 4. Transplant into the garden when soil is warm and there is no more frost expected. For peppers and eggplants, dig a hole large enough to hold the container. 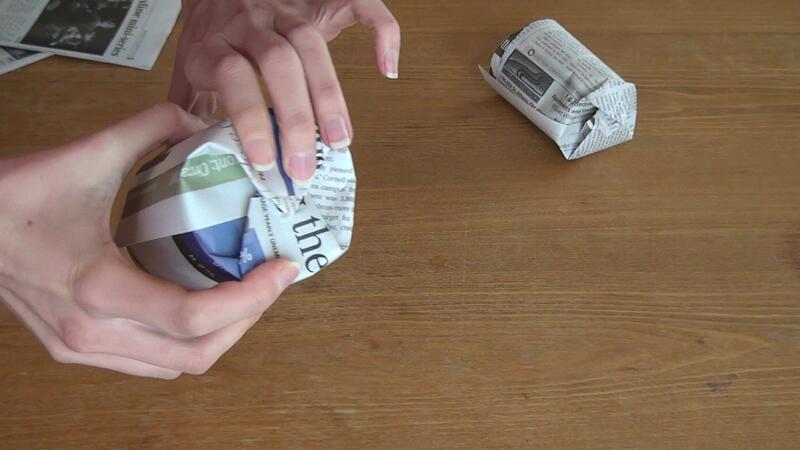 Cover the hole and a little bit of the stem with soil (the paper pot will biodegrade quickly). For tomatoes try the best method for growing tomatoes. Method for growing the best tomatoes! 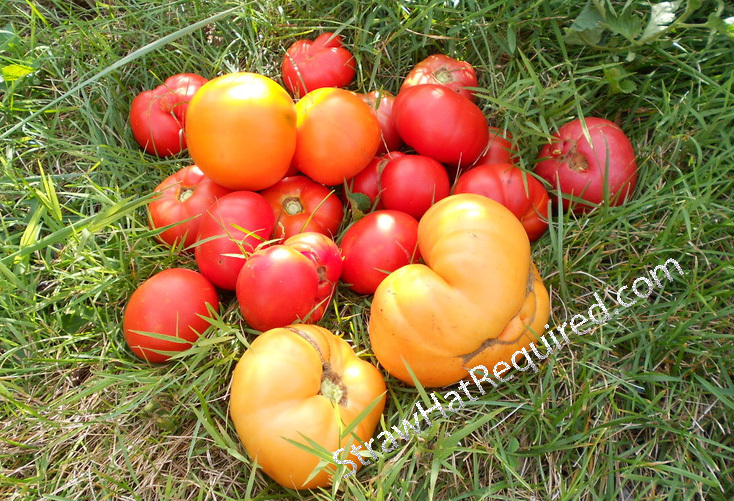 Let me share with you the best method to grow the greatest and largest tomatoes you have ever grown. My family has been using this method for years and it has not failed! I made a little diagram for you to look at (you know, one picture is worth many words! please find it below on the right with description on the left). This method gives your plants extra roots and extra roots = better plants and more tomatoes! Do not forget to grow companion plants with tomatoes. Plants love friends too!!! I love to grow basil, calendula and zinnias next to my tomatoes. 1. Get your transplants ready. 2. Discard all bottom leaves, leaving only two or three leaves on the top (put those unwanted leaves in compost). 3. Dig a trench in the ground and gently lay down your tomato plant. 4. Bury the plants stem, leaving those couple leaves out. 5. Walk away for a couple of weeks (I do not know about you, but I have to see my plants every day). You can stake them at this point or wait longer. At this point, tomatoes may take a couple of weeks to get going, but after that they will take off! Let me know if you have any questions or need more instructions. And as always – put your straw hat on and go play in some dirt!